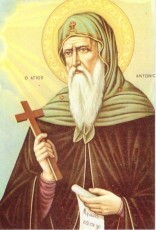 St. Anthony the Abbot also known as Anthony the Great was from Egypt, and a prominent leader among the Desert Fathers. The biography of Anthony’s life helped to spread the concept of monasticism, particularly in Western Europe through Latin translations. He was the first known ascetic to go into the wilderness. Accounts of Anthony enduring supernatural temptation during his time in the Libyan Desert inspired the “Temptation of St. Anthony” in Western art and literature. Most of what is known about St. Anthony comes from the “Life of Anthony”, written in Greek around 360 by Athanasius of Alexandria. It depicts Anthony as an illiterate and holy man who through his existence in a primitive landscape has an absolute connection to the divine truth. He was born in Coma, in Lower Egypt to a wealthy landowner. At age eighteen his parents died and left him with the care of his unmarried sister. He took the words of Jesus to heart, “If you want to be perfect, go, sell what you have and give to the poor, and you will have treasures in heaven; and come, follow me”. He sold everything, gave it to the poor and placed his sister into a group of nuns. He decided to follow the tradition of the hermits, and headed out into the Alkaline Nitrian Desert region about 60 miles west of Alexandria. He remained there for thirteen years. He was notably the first acestic to attempt living in the desert proper, completely cut off from civilization. He is called the father of monasticism, because he inspired hundreds of men and women to move into the depths of the desert, some organized into small communities. It is said when he passed, he requested to be placed in an unmarked grave. St. Anthony the Abbot lost his parents at an early age. He sold all his belongings, and gave them to the poor. He took literally the words of Jesus to sell everything, and follow Him. He went into the desert, and became the first ascetic to go into the wilderness and harsh conditions. He remained there for 13 years, and became well known for being the first to live solely outside of all civilization. The biography of Anthony’s life helped to spread the concept of monasticism, particularly in Western Europe through Latin translations.